It took a while, but The Americans Season One has been completed. All I can say is that few television shows have built a world that is nostalgic, exciting, a bit comic, and above all else, a story about a marriage. The story of Elizabeth and Philip Jennings is not just about KGB agents on their various assignments (though certainly it is about that). It is also about balancing work and family, those issues that in any era, but especially so in the booming 1980s, was becoming more and more relevant. Philip and Elizabeth work together as both spies and as their cover of travel agents, and the KGB has assigned them to be a married couple, so they dutifully produced two children: Paige and Henry. As such, we can imagine they spent almost all the time together. Any relationship that has become so insular, with few if any actual contacts on the outside, must be extremely difficult for them. They are not American, and in fact they should be working to bring America down. However, like in all good relationship stories, their individual views sometimes collide. Philip is more in tune with America, and in the twenty-some odd years of being 'Philip' he has grown comfortable and even pleased by what he sees. He is still loyal to the Soviet Union, but right from the start we see that Philip also enjoys a little impromptu dance with new boots at the mall, embarrassing Paige. We see that Philip is the one who is not above killing people, but who come to understand Americans in a way Elizabeth hasn't. Take one of the best episodes, In Control. Here, the chaos of Reagan's attempted assassination convinces Elizabeth that there has been a coup. It is Philip who tells her that despite all their years of living and studying Americans, she still doesn't get who 'these people' are. Americans, he basically tells her, don't do 'coups'. Philip and Elizabeth are also interesting in a different way. They are parents, ones who despite themselves sometimes lose sight of what is suppose to be their 'covers' and react to protect their children above all other concerns. When an older man makes advances on Paige, Philip appears to take the meek solution (soft verbal confrontation), but that guy didn't realize he was messing with a trained killer. Philip's violent take-down of that man almost leaves one cheering, for one expects any father to lay the smackdown on someone who would go after his little girl. Elizabeth for her part, being the harder and more emotionally restrained of the two, has a harder time bonding with her children as opposed to the more easy-going Philip. After all, when they tell Paige and Henry that they are temporarily separating, Paige especially is angry at Elizabeth, and while Philip is more openly affectionate towards them, Elizabeth's struggle to be a good mom (she is but not as good as her own standards will let her) is one of the issues The Americans presents. In short, Philip and Elizabeth are good spies who also want to be good parents. That balance, and the struggle to maintain that balance, is one of the best parts of the series. We grow to like Philip and Elizabeth, even as their actions are brutal. They kill, they hurt, they deceive others with more false identities. The struggles to be true to themselves, to figure out who they really are and what they really are working for (home or Country), along with some really wild adventures, makes The Americans such a fantastic program. We also have to complement some extremely brilliant performances. There are Rhys and Russell of course, who bring these complicated, conflicted, ruthless, efficient, and lovelorn characters to life. There's Noah Emmerich as their unwitting frenemy Stan Beeman, Annet Mahendru as Nina, the FBI mole in the Rezidentura who is playing a complicated game that even she isn't sure about. 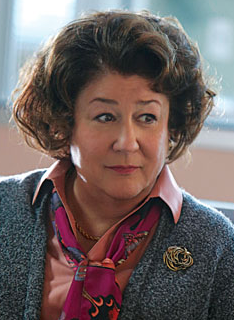 Above all else, there is Margo Martindale's Emmy-nominated performance as the Jennings' KGB minder Claudia, aka Grannie. As this outwardly sweet old dear, Martindale revels in the darkness, even evil, lurking beneath the endearing exterior. Only she would have a KGB's innocent and unsuspecting widow murdered and steal her baby to give to the KGB operative's parents, or enact brutal revenge on the man who ordered her once-lover's assassination. Seeing Martindale and Russell battle it out (sometimes literally, as when an enraged Elizabeth beats the living crap out of Grannie for torturing them when they suspected the Jennings were a mole) has been a personal highlight. Now, as always we have the countdown of The Americans Season One episodes from best to worst. That's higher than what I've given Sherlock so far (a show that is fiercely and fanatically loved by critics and Sherlockians, but which I, try as I do, cannot find worth all the praise). The Americans is about spies. It's about family. It's about how work and family conflict. Yes, it's also about the bad wigs the Jennings are forced to don (which adds to the charm of the show). It's also one of the best shows on television, one that simply needs to be watched. With Breaking Bad and Mad Men ending, perhaps it's time to look over not one but two anti-heroes whom we hate to love.